Cascais (pronounced Kush-Ki-sssh, with a ki like ky in Kylie Minogue), the beachy ‘burbs of Lisbon, is only a scenic 30 minute train ride from city center. We live in between, in São João do Estoril, 30 min by beach walk to Cascais, 5 min by train. The promenade that connects them is familiar territory. I walk it daily for a swim, to sit in a cafe and eat grilled fish, watch the surfers, or to enjoy an espresso and just people watch. To truly enjoy the area I recommend you explore by foot or bicycle. Here are two paths, for you to customize as you wish, stopping where something speaks to you. Both originating in Cascais. One to the North taking you all the way to Praia Guincho, the other headed south ending at my favorite seaside wine bar in São João. This journey begins with a choice. If you want to go all the way to Guincho you’ll need a car or a bike. A lovely day would be renting bikes in Cascais and cruising up the ocean front bike path with a picnic passing Boca do Inferno on the way! If you choose to walk you’ll probably want to turn around at Boca do Inferno. Roundtrip it’s a few hours with coffee breaks. Just before Boca do Inferno, you will also see the tunnel market. Great for gifts, I love the sheepskin slippers and the hand knit kids sweaters. Further along you will find Boca do Inferno (Hell’s Mouth) – if the sea is feeling firey you’ll see some big spout sprays. Don’t fall in! 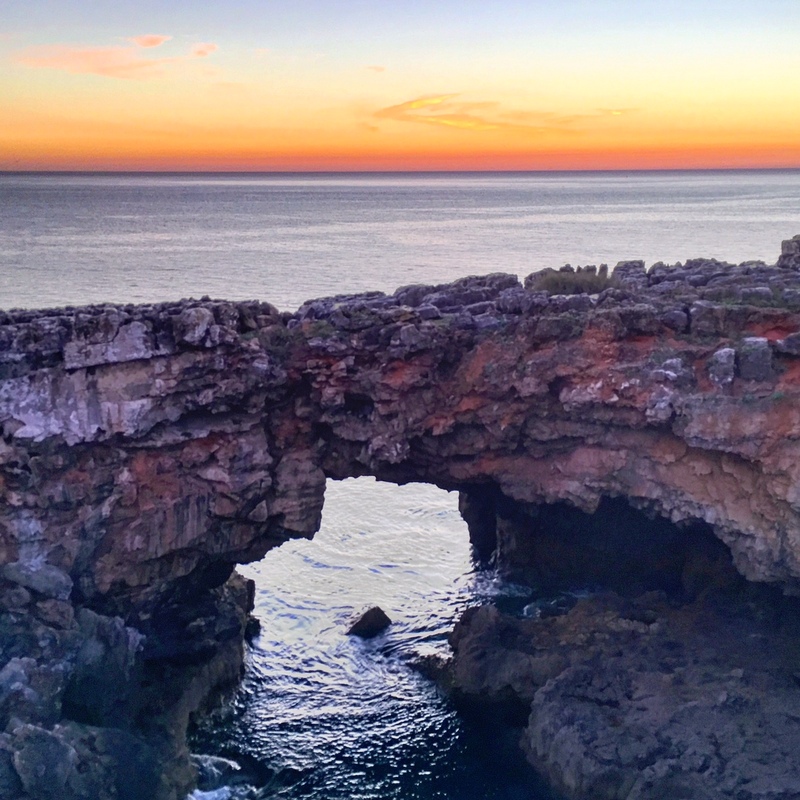 Accessible by car 10 minutes from Cascais or by bike (rent a bike, you won’t regret it). Guincho is exposed, and therefore known as on of the windiest beaches in Portugal, and is a favorite destination for surfers, windsurfers and kiters. It is also the sight of the most epic beach days I’ve had in Lisbon. It may also be the place where, as kids, my cousin and I proudly dipped our butter lathered crackers in sand and swore it tasted delicious…. When the sun is shining, the surf is pumping, and the beers are cold (have I mentioned how DELICIOUS beer is in Portugal?!?) something magical happens at Guincho. This requires a car unless you’ve got legs and nerves of steel. Drive 15 min further north, and you’ll find the Western Most Point in Europe. I remember coming here as a little kid with my cousin & Uncle and getting a wax stamp sealed certificate for having been here. I felt like an explorer having been to the end of the Earth! They no longer give certificates, but the view is incredible. And…since every good day ends with a cocktail and view, stop at Moinho Don Quixote for sunset. Cozy and romantic, with great drinks, killer views, quirky eclectic decor and an adorable resident cat. If you happen to come in the evening or in the winter, enjoy the fireplace nook inside. Sit back, kick up your heels and enjoy the moment. Choose your own adventure! Probably best to break these into two separate days unless you’re only walking to Boca do Inferno to the North. Before you leave Cascais, be sure not to miss Praia da Rainha tucked below Hotel Albatross. One of my personal favorites. From there you can easily find the beach boardwalk. And…you’re off! 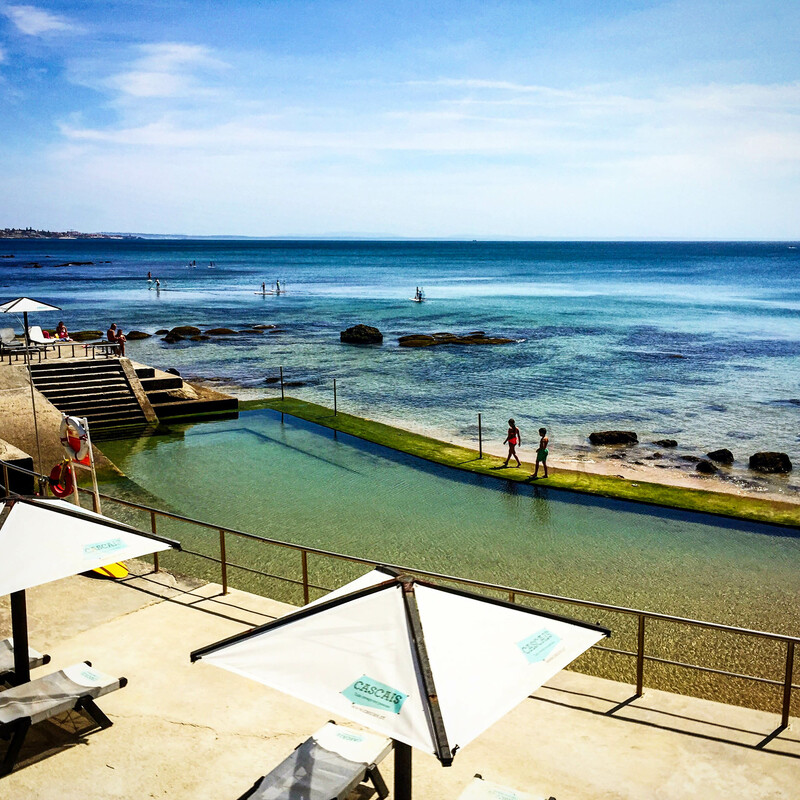 Head south to the main beach in Cascais. Here you can rent paddleboards, or swim out to the big jumpy castle or trampoline if it’s there. Boing boing boing…splash. Brilliant! Keep an eye out for the natural pools (first pic in this blog) when the tide is right they create a calm pool to swim in. Grab a X-Pop popsicle (pronounced “sheesh-pop”, which is basically a rocket pop dipped in pop rocks. Whaaa?!?) or an Agua das Pedras (my favorite bubble water, light on bubbles, with a hint of salt. Great for the morning after) at any red and white Olá stand along the way. Walking the promenade you will pass dozens of seaside restaurants and cafes, my favorite is toward the end of your walk at Praia da Poca. Look for the Supresa signs. Eat the grilled Dourada (fish) with a salada mixta. Or just have a cafezinho (espresso) and watch the local surfers. You are sitting in the family restaurant of a National Jr Surfing Champion! Welcome to my daily ritual. Head up the stairs and down the street to O Alcatruz Wine Bar to end the day with, what else? Drinks by the sea! Order the sangria, and a shared meet and cheese platter and enjoy the sunset. Hop the train back if you’re dogs are barkin’. The São João do Estoril station is only a 5 min walk, and takes you either back to Cascais or Lisbon. Dom Diniz – the cutest wine bar you ever did see. Small plates to share. Reservations needed, they have two seatings: 7:30 & 9:30pm. I recommend the manchego with honey/truffle oil/sea salt for dipping, presunto ham, octopus salad, shrimp in garlic, and the gaspacho. I always take guests here and they always go back. Moules & Gin – You guessed it. They serve Moules, 10 ways, and Gin. There are other items too but why bother. I love the Moules with Thai Lemongrass broth or Curry. House of Wonders – for those that don’t dig on swine. A vegetarian restaurant where every bite is delicious. Also great for lunch, check out the rooftop terrace! 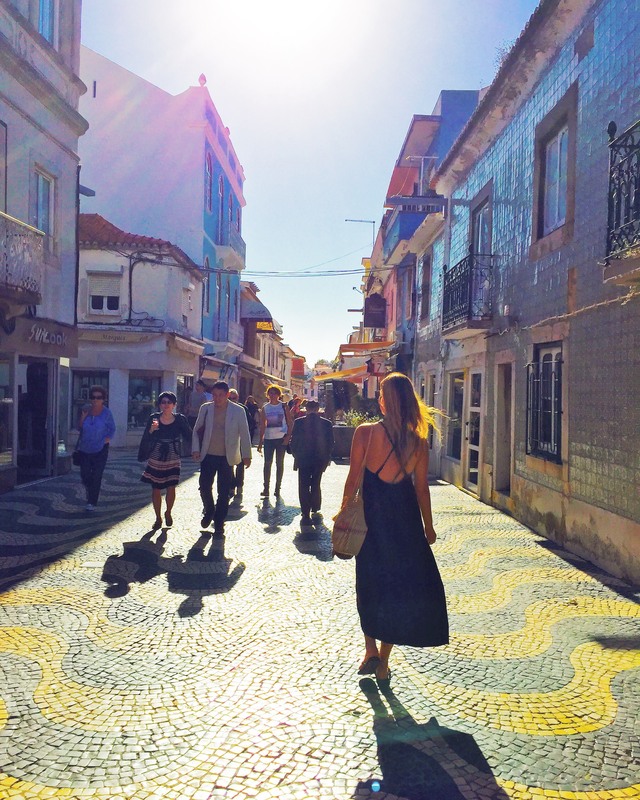 Couple these two beach days with a day or two exploring the sights of Lisbon and you’ve got yourself a solid three day itinerary. But don’t forget Sintra or any other weekend getaway destinations! Portugal is a treasure trove to explore, and Cascais is one of it’s shiniest jewels. Beijinhos!